Tonight was supposed to something really exciting to a few of us - a special dinner to revisit some of the favorite dishes from a restaurant that no longer is. But it didn't work out as originally planned, and as a backup, I suggested that we do Japanese instead - so I could open a particular bottle of sake. Today, after all, is the 4th anniversary of the Tohoku disaster. I still remember watching the events unfold on TV like I was witnessing a nightmare, and I had organized a couple of dinners in the months that followed in support of Japanese restaurants in Hong Kong - including one whose chef had lost his brother in the disaster. 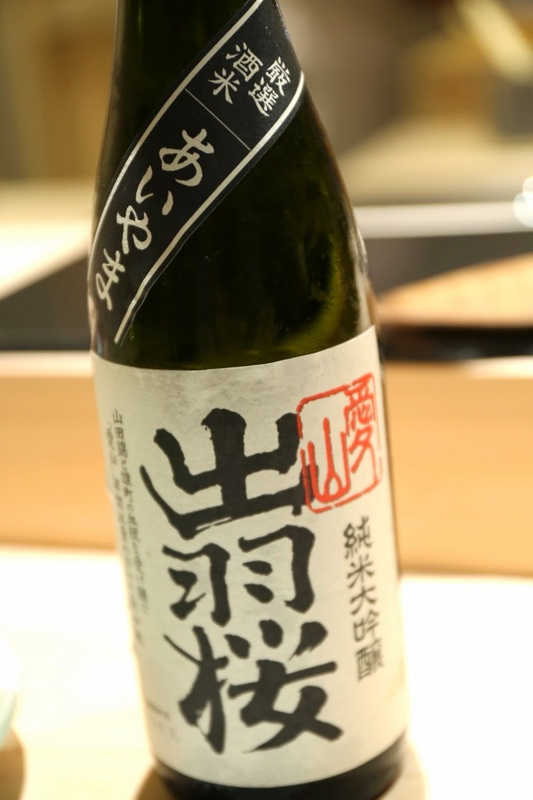 At those dinners we opened bottles of sake from different prefectures in the Tohoku region, as a way to support business in the region. I would be doing the same tonight. As our favorite izakaya was no more, my friend suggested having sushi at Imamura (今村). This place used to be one of the only high-end sushi restaurants that I would go to, but I haven't been here in a while. In fact, my last visit over 5 years ago was itself a refresher after a long absence. There are now many alternatives for high-end sushi in town. How will this place stack up? I guess the understanding is that when you sit down at the counter, you are automatically asking for omakase (御任せ)... because we were never asked, other than checking for allergies and preferences. Omakase it is, then... even though I would have preferred a smaller dinner. This was a fish that was supposedly called メルゲ - although I couldn't figure out what exactly it was - on top of a bed of raw onions, with sesame dressing. Mozuku (水雲) - marinated in ponzu (ポン酢) and served with a little ginger. Monkfish liver (鮟肝) with cockle shell (とりがい) - always love the creamy texture of the monkfish liver, and the diced onions are a natural accompaniment. The cockle shell wasn't bad, either. Wild red snapper (天然鯛) - nicely scored. Great amberjack (間八) - wonderful thick cut, and very buttery and silky. Very satisfying to bite into. Ark shell (赤貝) - I'm usually not a big fan, but this was tasty. Surf clam (北寄貝) - lightly torched and dabbed with a little sudachi (酢橘), and served with a spicy paste on the side made with paprika and fish. Octopus (鮹) - marinated and torched. Very soft texture. Japanese geoduck (本海松貝) - Hong Kong just imposed a ban on the import of Canadian geoduck, so the restaurant made sure to let us know that this was Japanese. Firefly squid (蛍烏賊) - marinated as is typical, which means it was pretty salty. Abalone (鮑) - served with sauce that was made with the abalone's liver. Very, very tender... and pretty tasty. We got an extra ball of rice, which was used to soak up the leftover liver sauce. Yum! Squid (烏賊) - nicely scored, and the sauce was flavored with citrus like yuzu (柚子) or sudachi. Splendid alfonsino (金目鯛) - really nice and melted in the mouth thanks to the fat, but for some reason the finish wasn't so tasty. Gizzard shad (小鰭) - wonderful acidity thanks to the vinegar marinade. Always one of my favorites, and can't wait for the babies later in the year. Sprinkled with bits of shiba shrimp (芝海老). Filefish (皮剥) - as is common nowadays, served with a sauce made with the fish's own liver. Aged sweet shrimp (熟成甘海老) - slightly different texture thanks to the aging. A little salty, but nice and fragrant thanks to the yuzu rind. This was my replacement for the fatty tuna that I declined. Egg (卵) - nice to see that the egg here was done in the higher-end sponge cake style, but the texture was a little too hard for my liking. I was also surprised that this was a lot less sweet compared to what I'm used to. Green tea panna cotta - this wasn't bad at all... Just a regular panna cotta with a layer of green tea sauce on top. The sake I brought tonight was made by Dewazakura (出羽桜) in Iwate Prefecture (岩手県), which is part of the Tohoku region. I picked up this bottle a few months after the disaster in 2011, as I consciously wished to support businesses from that region. It's been sitting in my wine cellar for more than 3 years, waiting for a chance to be drunk. Tonight seemed the perfect occasion for it. Dewazakura Junmai Daiginjo Aiyama (出羽桜 純米大吟醸 愛山), released Jan 2011 - aged for four years and now showing a light, yellowish color. Nose was a little oxidized, and showing similarity to Chinese yellow wine or a French vin jaune. Slightly mineral and savory on the nose. Medium palate with a slightly dry finish, with complexity and depth of flavors. Seemed a little more viscous than expected. Seimaibuai (精米歩合) of 45%. Made from Aiyama (愛山), a very special strain of rice which is a cross between Yamada Nishiki (山田錦) and Omachi (雄町).